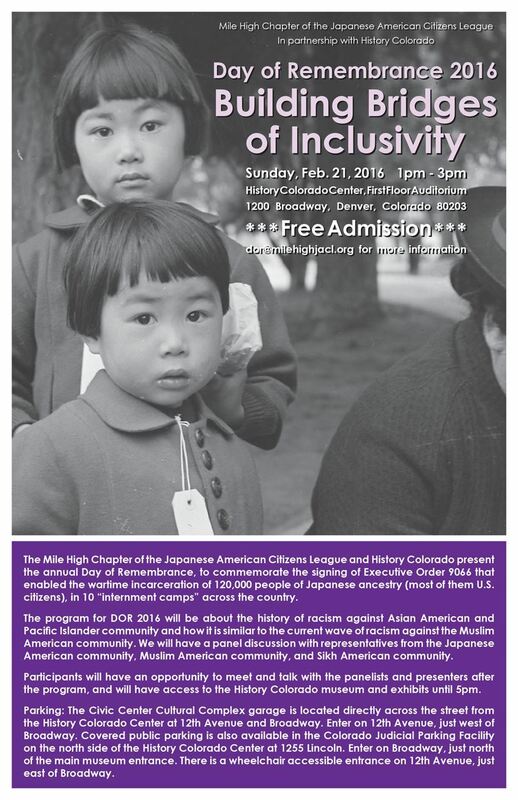 "The Mile High chapter of JACL invites educators and the public to the annual Day of Remembrance event, which will be held 1-4 pm, Sunday Feb. 21, at the History Colorado Center, 1200 Broadway, Denver. The Day of Remembrance marks February 19, 1942, when President Franklin Roosevelt signed Executive Order 9066, which cleared the way for 120,000 people of Japanese ancestry to be incarcerated in American concentration camps during World War II. President Ronald Reagan signed into law the Civil Liberties Act of 1988 which admitted that the incarceration was based on "race prejudice, war hysteria, and a failure of political leadership," and formally apologized and offered reparations for families of those imprisoned. The 2016 Day of Remembrance event is themed "Building Bridges of Inclusivity" and will feature a presentation about the history of anti-Asian prejudice in the United States leading up to the WWII concentration camps and Amache, the camp in southeast Colorado. The event will conclude with a panel discussion moderated by Facing History, with representatives from the Japanese American, Muslim and Sikh communities."